1. Promo period is from February 8, 2019 to May 31, 2019. 5. Select additional items/accessories/gifts to be purchased, if any. 6. To avail of the discount, card holder must enter PNB plus first 6 digits of the card as “Promo Code” in the redeem field then click the Redeem Button. Total amount will adjust to the discounted value. 8. A virtual invoice will appear with the Order Number for the customer’s reference. An email will also be sent to the customer’s email once order has been processed. 1. Cardholder may email Island Rose at helpdesk@islandrose.net for customer concerns. 2. Promo discount is non-transferable and cannot be converted to cash or exchanged for other items. 3. The promo cannot be availed in conjunction with another promo and discounts. 4. 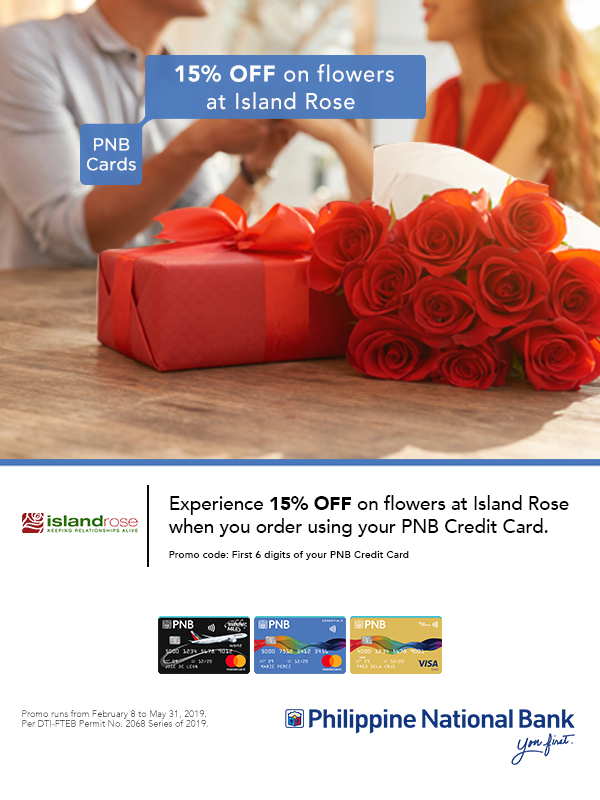 Any dispute concerning the products and services related to the promo offer shall be settled directly between the Cardholder and Island Rose. 5. In case of dispute, the decision of Island Rose and PNB with the concurrence of DTI shall be considered final. 6. The Terms and Conditions governing issuance and use of PNB Credit cards are incorporated herein by reference and made an integral part hereof. PNB Cards 24/7 Hotline (+632) 818 9818 / DTF 1800 10 818 9818.